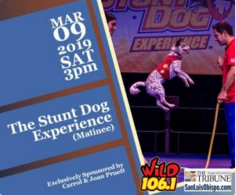 Featured on news programs, in magazines, in multiple national television performances, and in amusement parks and performing arts theaters all across the country, Chris Perondi and his troupe of incredibly well-trained dogs are ready to bring the ultimate Stunt Dog Experience to the Clark Center once again! The Stunt Dog Experience features amazing tricks, high jumps, sensational stunts, cute comedy and dancing doggies, adding up to the biggest collection of canine capers in the country. All of these performing pups have been rescued from pounds and shelters across America, and they can’t wait to show off their skills for you and your whole family.